If you’re a first-timer, let’s explain our award-winning tours – 1770 LARC! 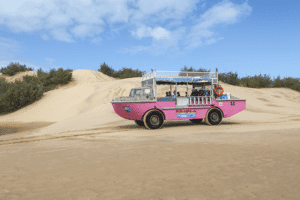 Tours utilise our two pink amphibious crafts to access and explore the National Parks, restored lightstation and pristine waterways bordering the Birthplace of Queensland – the Town of 1770. Guests wishing to transfer their tour booking, prior to the day of departure will incur a $25.00 per person Administration Fee. December 26th – January 4th Cancellations made within 48 hours of departure 100% non-refundable; outside 48 hours – 20% cancellation fee. Tour itineraries are subject to change at the discretion of 1770 LARC! Tours in the interest of passenger & crew safety, health and comfort. 1770 LARC! Tours reserve the right to cancel tours due to strong/gale force wind warnings, as issued by the Bureau of Meteorology. If a tour is cancelled by 1770 LARC! Tours due to rough weather policy or unforeseen circumstances, tours will be rescheduled or fully refunded. Please note that all tours have minimum guest participation requirements and may be cancelled/transferred depending on the number of guests participating. In the event of a cancellation by 1770 Environmental Tours we endeavor to issue as much notice as possible and appreciate your efforts to do the same.